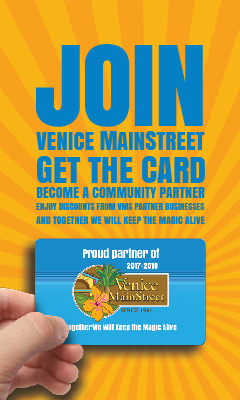 Venice MainStreet, Inc. is a community and volunteer driven 501c3 nonprofit organization committed to the mission of promoting economic vitality, historic preservation and beautification, and enhancement of the character of our Historic Downtown Venice community. In support of that mission, Venice MainStreet, along with the help of supporting grants from Visit Florida, the Ehrhart Family Foundation and our advertising partners, has installed a mural entitled “Venice Is” at Sarasota Bradenton International Airport (SRQ) sharing all the various amenities Venice has to offer visitors and the community. At the dimension of seven (7) feet in height and eighty-five (85) feet in length, the “Venice Is” mural is displayed prominently in the Sarasota Bradenton International Airport Baggage Claim area, number 2. Sarasota International Airport reports serving more than 1.3 Million air travelers yearly. Enticing those travelers to visit our historic downtown Venice will have great economic impact on the community at large. Venice MainStreet is proud to have the opportunity to present “Venice Is” to such a diverse and enthusiastic group of regional travelers. 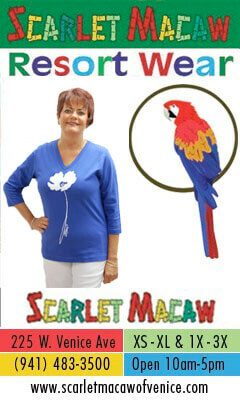 at Venice MainStreet, Inc. Email erin@venicemainstreet.com.